Note: This review is intended for our international readers only. Leo Vegas Casino does not accept Australian players and Australians cannot gamble online as of September 2017 due to the Interactive Gambling Amendment Bill 2016 coming into full legal effect. Leo Vegas is one of our favourite online casinos for many reasons. Not only is it one of the most aesthetically pleasing venues going around, it also offers one of the biggest ranges of card games from a collection of the world’s leading software developers. With such awards under its belt as Best Innovation in Casino, Mobile Casino of the Year (EGR Innovation Awards) and a finalist for Best Gaming Operator of the Year (ICE Totally Gaming Awards), when playing at Leo Vegas you can expect the highest quality real money casino games and customer support. Games can be demoed for free without signing up, but you’ll need to register for an account if you wish to start playing games for real money. Leo Vegas offers some superb bonuses for new players and by following our links to sign up you’ll not only receive 200 free spins on the slots to get you started but also a 200% matched deposit bonus when making your first real money deposit. Sign up to receive email communications to stay in the loop of fantastic promotional offers which often include cash and real world prizes like holidays and tech gadgets. 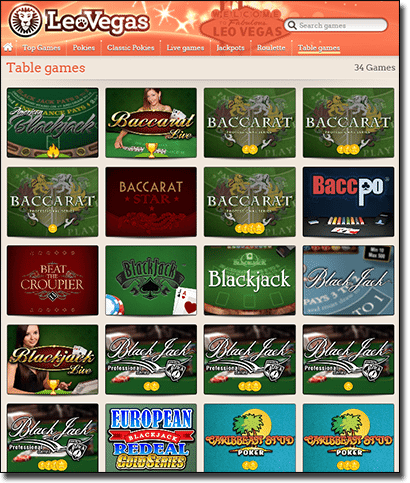 Leo Vegas is a browser based casino, which means no downloads are required to access the games and you can start playing immediately over your web browser. This is a big plus as it makes games accessible for players using a range of operating systems including PC’s, Mac’s and mobile devices. Leo Vegas also offers games for free in demo mode, so if you’re new to online gaming or want to practice your strategy on a card game before committing to a real money bet you can do so with ease in instant play mode with no risk to your wallet. Blackjack – Leo Vegas offers several great blackjack variations, making it great for 21 fans who want to branch out and try something different. The graphics used in Leo Vegas blackjack games are premium, with minimum bets catering to players with smaller bank rolls as well as maximum bets which will appeal to high rollers. Notable 21 variants at Leo Vegas include American Blackjack, Blackjack Professional Series, Double Exposure Blackjack, Grand Blackjack, Single Deck Blackjack and live dealer blackjack. Poker – there’s a good handful of RNG (random number generator) poker games at Leo Vegas along with a selection of live dealer poker titles. Real money players can choose between Caribbean Stud Poker, Texas Hold’em Pro Series, Oasis Poker Pro Series, Pai Gow Poker, live dealer Casino Hold’em and Live Dealer Three Card Poker. You’ll also find a few video poker variants under the ‘classic slots’ section including Joker Poker, Deuces Wild and Joker Wild. Baccarat – feel like James Bond as you play your way through several sophisticated baccarat versions at Leo Vegas, including Baccarat Pro Series, Baccarat Star, Beat the Croupier, BaccPo and live dealer baccarat. Slots – Leo Vegas has literally hundreds of online slots available, from classic slots to progressive jackpot slots. Popular titles which get our two thumbs up include Dazzle Me, Fruit Shop, Hall of Gods, Vegas Party, Game of Thrones, Taco Brothers, Twin Spin, Starburst, Piggy Riches, Nirvana, Pyramid Quest for Immortality, Mega Moolah and Mega Fortune Dreams. Roulette – with over 20 roulette variations on offer, Leo’s collection is up there with the biggest roulette catalogues. Place inside and outside bets on games like American Roulette, European Roulette, Immersive Roulette Live, French Roulette, London Live Roulette, VIP Auto Roulette and Auto Roulette Low Limit. Leo Vegas has won multiple awards for its mobile casino and once you try it for yourself you’ll know why this site is considered to be one of the world’s leading mobile casinos. Like the desktop site, Leo Vegas is available via mobile web browser, which means it doesn’t matter whether you’re using an iOS or Android system. If have an iPhone, iPad, Samsung Galaxy, BlackBerry, HTC or any other smartphone or tablet, as long as you’re running relevant Flash, HTML5 or Java software on your mobile device you’ll be good to go. Slots fans get the best end of the deal, with over 250 mobile slots available, but there’s also a majority of the same card games available for mobile as the desktop site, with mobile live dealer games also available. Leo Vegas protects all payment submissions using a 2048 Bit SSL encryption certificate, which means deposit details and personal information can’t be intercepted by any third parties, leaving users to play without concern to their security. 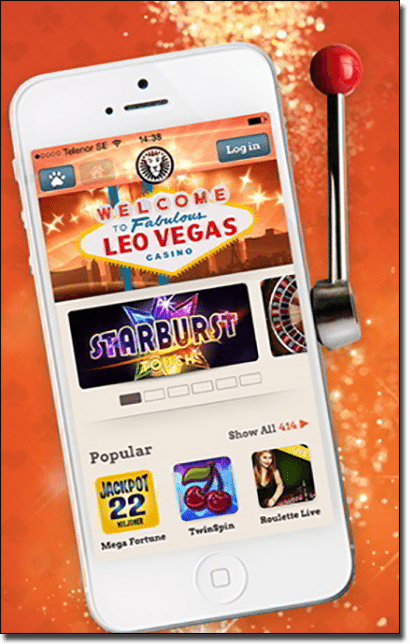 Sign up for a new account at www.LeoVegas.com by clicking any of our links, and enjoy exclusive new player bonuses on us.